I am delighted to share that I have new solo show at Cavallo Point in Sausalito, CA – both in their art gallery (pictured here) and in their healing center. This lodge at the foot of the Golden Gate Bridge has a unique art program. In addition to the gallery, each guest room features original fine art work on extended loans by wonderful local artists including Linda Connor, Judith & Richard Lang, Candace Gaudiani and many more. 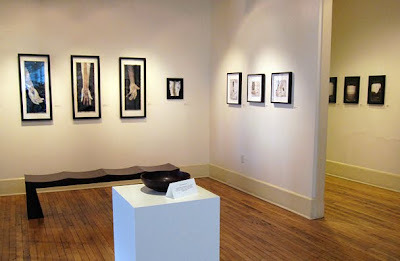 I was thrilled when curator Anne Veh contacted me last fall about showing my work there. I have to say I hesitated though when she told me the dates because the show was to open January 5 – just two days before the due date of my second child. Fortunately Anne was open to creative solutions, so in mid-December when I was very round with pregnancy, we met in my studio and selected all the work, wrapped it up, and she took it with her and stored it at her home until she installed the show a few weeks later. I had to really let go in a way that I don’t usually with an exhibit and let Anne truly “curate” – a word whose etymology means “to take care of.” She has attended to all the myriad details of the show beautifully. One of my favorite parts of this exhibit is the spirit of generosity that is present. 10% of all sales proceeds go to the non-profit of my choice. I selected Lily Yeh’s outstanding organization Barefoot Artists which “works with poor communities around the globe using art to bring healing, self-empowerment and social change.” And then at Anne’s suggestion, we created a give-away for every visitor. In the center of the gallery is a wooden bowl filled with rolled scrolls tied with ribbon, and inside each is one of my favorite quotes about the creative process. There are 11 different quotes, so each visitor can intuitively pick the best one for him or her. As you can see from the photo above, the bowl was empty the day I visited as these have been so popular that it has been hard to keep up with the demand, but I have been assured that the bowl is replenished often. If you are unable to attend the show, but would still like the creative inspiration, please email me and I will send you a pdf of the quotes. One of the quotes is George Braque: “Art is a wound turned into light.” Anne as a curator really understood right away the healing inherent in my creative process, and chose to emphasize this aspect in the show. She selected a very nice group of over 40 pieces from 5 different series including Mapping the Body, Milagros, Evocations, and Sanctuary (pictured in the photo above). I do hope if you are in the Bay Area that you will get a chance to see the show and/or hear my artist talk on March 22. For directions & more information, please see www.cavallopoint.com or call 415-339-4740. Congrats on your solo show! That’s such an awesome accomplishment and so cool that part of the proceeds are going to a non-profit. Have you seen the virtual tour on Cavallo Point’s website (http://www.cavallopoint.com/shop.html#art-gallery)? You should see if you can get your works included!